Just two months after the first Everest trailer debuted, United Pictures International Malaysia has debuted an IMAX trailer. Shot in various locations in Nepal, including the actual Mount Everest base camp, Everest brings a fascinating true story to the big screen for the first time, with Jake Gyllenhaal leading an all-star cast. This upcoming thriller arrives in theaters September 18, going up against Warner Bros.' Black Mass, Paramount's Captive and 20th Century Fox's The Maze Runner: The Scorch Trials. Inspired by the incredible events surrounding an attempt to reach the summit of the world's highest mountain, Everest documents the awe-inspiring journey of two different expeditions challenged beyond their limits by one of the fiercest snowstorms ever encountered by mankind. Their mettle tested by the harshest elements found on the planet, the climbers will face nearly impossible obstacles as a lifelong obsession becomes a breathtaking struggle for survival. The actual climbing expedition that the film is based on resulted in the loss of eight lives in 1996. Jake Gyllenhaal leads the cast of this epic adventure, which also stars Jason Clarke, Josh Brolin, John Hawkes, Martin Henderson, Emily Watson, Michael Kelly and Thomas M. Wright. Much like the true story this adaptation is based on, the production it self was quite perilous. While second unit production was taking place on Base 2 of Mount Everest, an ice wall collapsed creating an avalanche. Cast and crew members were unharmed, but the avalanche did claim the lives of 13 other climbers and sherpas. Everest is directed by Baltasar Kormákur and produced by Working Title Films' Tim Bevan and Eric Fellner, Cross Creek Pictures' Brian Oliver and Tyler Thompson, as well as Nicky Kentish Barnes and Kormákur. Universal and Cross Creek Pictures' presentation of Everest-in association with Walden Media-is adapted for the screen by William Nicholson and Oscar winner Simon Beaufoy. The film was shot on location in Nepal on the foothills of Everest, the Italian Alps and at Cinecittà Studios in Rome and Pinewood Studios in the U.K. 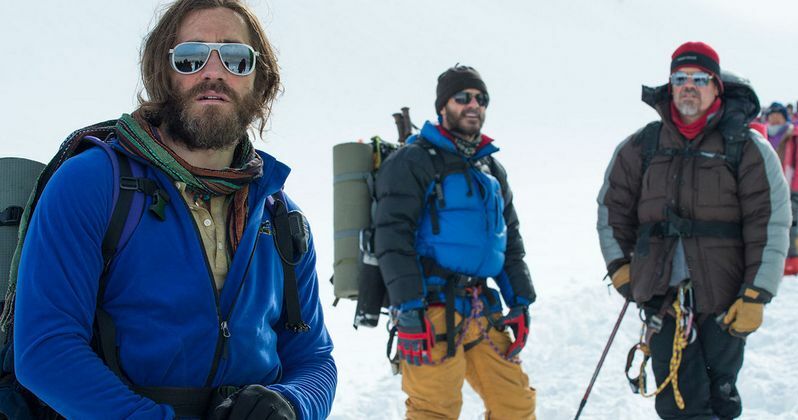 Check out the latest trailer for Everest before it debuts in IMAX theaters worldwide on September 18. With an all-star cast in place and an incredible true story, Everest may be able to take the box office by storm when it hits theaters next month. Will you be watching this Mount Everest true story unfold in IMAX theaters?